In the age of instant news and viral video, a seemingly inconsequential stand-off between a young white teenager and an elderly Native American man in the United States made headlines across the world. Nick Sandmann and friends from his private Catholic school had been in Washington DC attending an anti-abortion protest. Most of his (mainly) white friends sported MAGA (Make America Great Again) caps and were in ebullient mood after their day trip to the US capital. Rushing to judgement, most of the liberal video, based on the initial short video clip, immediately denounced the ‘confrontation’ as an example of white privilege and racial snobbery. Later, extended footage was made available which showed the boys being verbally attacked by a group of black men from a bizarre religious cult called the Black Hebrew Israelites, who were also protesting that day. 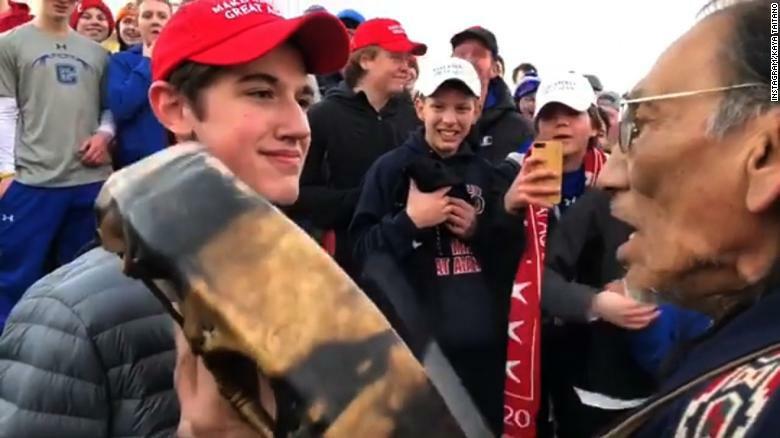 A group of Native Americans, led by Nathan Phillips, also entered the fray, whilst banging a tribal drum, and a seemingly amusing stand off between the white teenager and elderly Native American developed. Nobody was hurt or arrested and everybody went home safely afterwards. Quickly, the stand-off became a symbol of white racial hatred and the MAGA hat akin to a KKK hood. Thanks to the initial liberal media coverage, death threats were made against the school and the pupils, particularly the smirking teenager, Nick Sandmann. His family have threatened to sue those in the liberal media who smeared them and most have backed down as a result. Meanwhile, Nick Sandmann and friends have entered American cultural history! Next Post How British are Muslims?